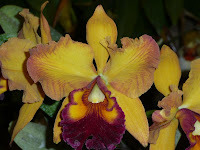 Today we went to an Orchid show with our friends and co-workers, Gordon and Norma Pike. The show was a large display from various growers showing some of the 1500+ varieties (!!) 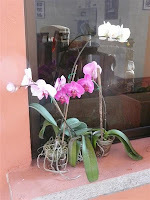 of orchids that are native to Costa Rica. As you may be able to tell from some of the photos in the slide show on the right, purple was a prevalent color! Marcette was extremely excited to walk out with a couple of orchids to try her hand at growing (second photo).